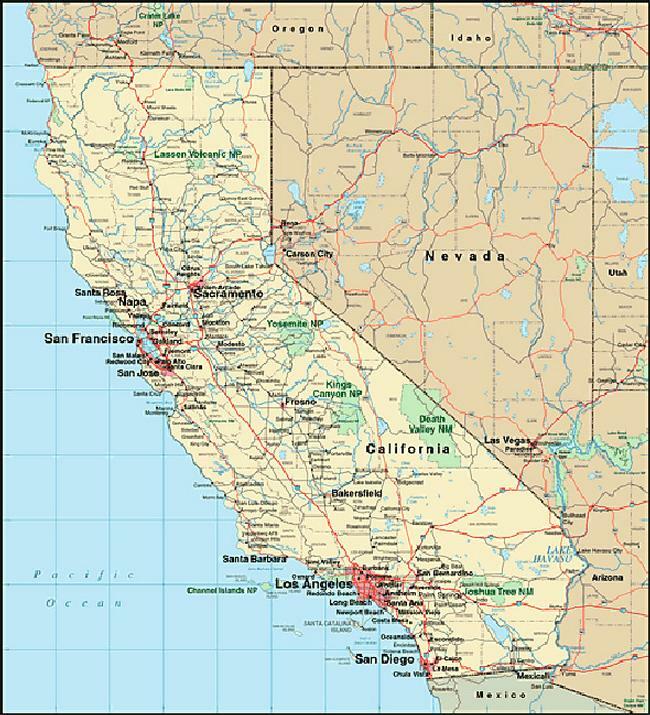 On this map of California you can see the state borders, major cities, national parks and neighboring states/country. Oregon, Nevada, Arizona and Mexico border the state. The west coast of the state overlooks the Pacific Ocean. Across the Pacific, about a 6-hour flight away, lie the Hawaiian islands. There are many interesting places to visit. Travel to cities like San Francisco and Los Angeles for shopping and sightseeing. Visit the mountains to relax surrounded by nature. The wine country is world-famous, producing some of the top wines. There are many excellent inns and resorts in Napa and Sonoma. View redwood trees turned to stone at the Petrified Forest of Calistoga, a private park established in 1910. Go for a hike through the park, visit the museum which explains the geology of the area, and pick up souvenir crystals at the gift shop. The Petrified Forest of Calistoga is open daily from 9am to 7pm (9am to 5pm in the winter). Please call before you go as opening hours and prices are subject to change. Admission is $6 for adults, $5 for seniors over 60, $5 for juniors (12 to 17) and $3 for children (6 to 11).